1940s fashion – Vogues Summer Makeup guide 1947. 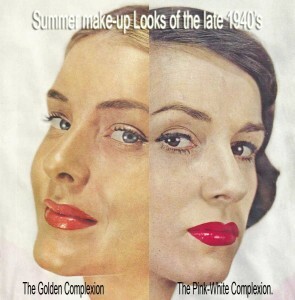 Vogues Summer Face Guide for 1947. It’s summer – at-least in the northern hemisphere, and if you’re a young woman in 1947, you’ll be scanning vogue magazine for the latest advice on makeup looks for those balmy days ahead. This is the sort of look a face might wear under the brightest summer sun. the make-up here is an accessory to sports clothes, or a bathing suit. And make-up can give this look even to a face that is more often sun-shaded than sun-gilded. The golden complexion can be a cover of heavily tinted cream-and-powder foundation, used without further powder ( the faintest shine is part of the charm). With this complexion, you use a pale coral, red, or russet lipstick, a touch of sea-blue or sea-green eye-shadow, give shine to your lashes and to your flat brushed brows. This is the sort of look a face might wear in the cool shadows of summer – under a thickly leaved tree, under a terrace awning, under the shade of night, anywhere. The make-up, in this case, becomes pink-and-white precise, carefully calculated as an accessory to the pretty, beige and grey dresses you will wear this autumn. And make-up can give this look to all but the very sun-tanned. The complexion can be covered with a lightly tinted foundation, plus double-the-usual dusting of creamy-pink powder. Then: a blued-pink lipstick drawn on the natural lip line. deeply shadowed eyelids. Pencilled, brushed-thin brows. And a light touch of mascara on the lashes. Voila!